Mindy Scott began her real estate career in 1994 and obtained her Broker license in 2000. After operating and managing a top producing real estate company for 18 years, she partnered with Jeff Ramsey and formed Ramsey Realty Group. Mindy has trained many top producing agents and been involved in every aspect of real estate from sales, training, management, relocation, development and marketing. Establishing and operating a real estate company based on Christian values is of utmost importance to her. 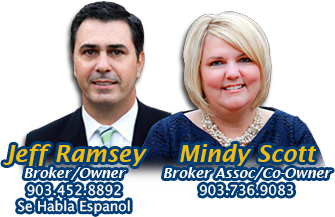 Mindy has vast knowledge of the Longview market since residing in Longview for almost 30 years. She is familiar with school districts, neighborhoods, local events/organizations and businesses. She is compassionate, creative, fair, honest, a tough negotiator and always strives to do the right thing. It is important to her to give back to the community in which she resides. This is accomplished through the Ramsey Realty Group Charity Fund and by her commitment to personally volunteer and assist worthy organizations, her children's school and church activities/events. In addition to real estate sales/management, Mindy enjoys building houses to sell, playing tennis, decorating, home design/construction, shopping for antiques and attending auctions. Mindy is married to Longview native, Jim Scott and has two teenage children, Charlie and Anna.